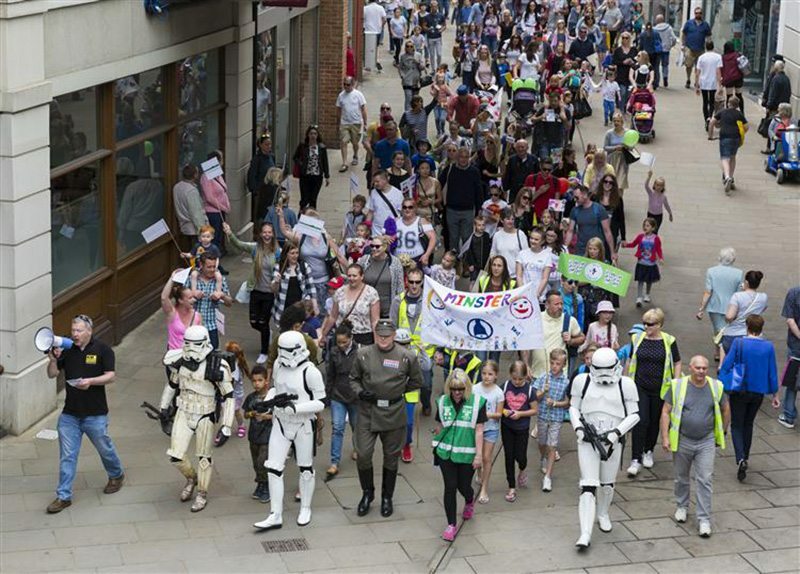 The regional record attempt involved 329 people who marched through the city centre singing a special song trumpeting the virtues of walking to school. Families using the green travel scheme Active Wow (Walk on Wednesday) or the reading reward scheme Buster’s Book Club were invited to the annual event. After the walk everyone returned to the Dane John Gardens where children took on a variety of activities in return for a goody bag full of prizes including a family skate or swim voucher from Active Life, an Orbit squashee, Whitefriars books, and leisure attraction tickets. The fun included space hopper racing hosted by Specsavers, ‘beat the goalie’ run by Canterbury Eagles football club, Atlantis Go-Karts, Active Life yoga, and circus skills with Paul Incredible of Kinetic Circus. Lucky programme competition winners scooped prizes including a day trip to Bruges for two, donated by YMS Group, a family cinema ticket or a £125 spectacle voucher, supplied by Specsavers, and a Canterbury Monopoly game donated by Whitefriars. Twelve youngsters were awarded best flag prizes of bags of goodies provided by Tiger and Smiggle Canterbury. Fruit bags and drinks supplied by McDonald’s were handed out by youngsters from Canterbury Eagles FC. The free festival for families was organised by the KM Charity Team, with support from IMP, to celebrate the success of the charity’s green travel and literacy services for schools in the South East.